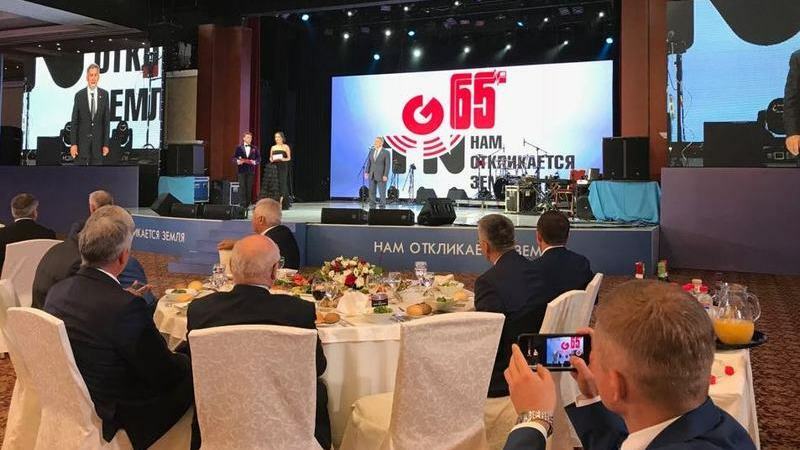 Kazan saw a ceremonial event on the occasion of the 65th anniversary of the TNG Group, one of Russia's largest high-tech geophysical service companies. The ceremony was opened by Tatarstan President Rustam Minnikhanov. In his welcoming speech, Minister Albert Karimov noted that the company has a unique expertise of successful work in various climatic and geological conditions. The TNG Group currently participates in all commercial projects of major Russian oil and gas companies. The company is well known both in Russia and in the CIS countries, Asia, and the Middle East. The TNG Group is involved in the Arctic development in the Laptev Sea waters, intensively operates on the Russian shelf of the Sea of ​​Okhotsk and the Kara Sea. The use of latter-day technologies, the availability of highly-qualified professionals, the implementation of their own scientific developments ensure that the company enjoys a high rating in a highly competitive geophysical services market and successful cooperation with leading Russian and international oil companies. As admitted by them, TNG Group is the No.1 company in the geophysical well logging segment. In the presence of the honourable guests, current and retired employees of the company, Minister Karimov awarded workers of the TNG Group with honorary distinctions and gifts. On April 12, 2019, within the framework of the programme activities of the Tatarstan Energy & Resource Efficiency Forum (TEF 2019), the by now traditional Youth Day was held at the Kazan Expo International Exhibition Centre. The organisers of the Youth Day were the Ministry of Industry and Trade of Tatarstan, the Kazan State Power Engineering University, and the Tatarstan Centre for Energy Saving Technology under the Tatarstan Cabinet of Ministers. In the final part of the event, a winners’ award ceremony was held for the Republic’s Youth Initiatives Contest “We Opt for Energy Efficiency 2019” and the Energy Quiz event held among youth teams of Tatarstan’s fuel and energy companies. Awards and diplomas were presented to the winners by Deputy Minister of Industry and Trade of Tatarstan Almaz Khusainov jointly with Principal of the Kazan State Power Engineering University Eduard Abdullazyanov. A commissioning ceremony for a new benzene extraction unit took place today. The unit was completed in late 2018, and in March this year it was brought to designed capacity. The new production facility is expected to optimise the processing of the benzene-containing fraction within the production process and relieve the existing energy-intensive units. With the help of the unit, the company expects to increase the annual benzene output up to 265,000 tonnes, which would give an opportunity to completely cut its purchases from third parties. In Nizhnekamskneftekhim, benzene is used for the production of ethylbenzene, styrene, which are applied for the preparation of rubbers and polystyrene. Products made out of polystyrene include disposable dishes, toys, it also finds an application in the tyre, construction, medical sectors, and in other fields. Today, the conference hall of the Nizhnekamskneftekhim administrative building also hosted an annual general meeting of shareholders, which summed up the results of the Company's financial and economic activities in 2018. The meeting was attended by First Deputy Prime Minister of Tatarstan Rustam Nigmatullin. Company’s Director General Azat Bikmurzin made a report on the 2018 results. Last year, Nizhnekamskneftekhim continued its sustainable development, improving performance and economic figures in the interests of its shareholders and employees. From 10 to 12 April, a delegation of the Altai Territory headed by its Governor Viktor Tomenko is visiting the Republic of Tatarstan. The mission of the visit is to study the experience of Tatarstan in various fields and to establish direct contacts between enterprises and organisations of the regions. The delegation visited the Tatarstan Investment Development Agency, the Technopolis Himgrad, the Alabuga Special Economic Zone, and the Naberezhnye Chelny PSEDA. Meetings were also held with top executives of TAIF, Tatneft, and Tatenergo. On April 11, an extended meeting was held with Tatarstan President Rustam Minnikhanov, at which an Action Plan was signed to implement the Agreement of Cooperation between the Government of the Altai Territory and Tatneft. The document was signed within the framework of the Agreement of Cooperation previously concluded between the Altai Territory and Tatneft to include Company’s partnerships with industrial enterprises of the Altai Territory in the field of energy efficient technologies, implementation of import-substituting projects, production of oilfield equipment, and other issues. On April 12, a meeting between enterprises of the Altai Territory and the Republic of Tatarstan was held at the Tatarstan Chamber of Commerce and Industry. Partnership relations between the regions are developing within the Agreement on Trade, Economic, Scientific, Technology, and Socio-Cultural Cooperation signed earlier between the Altai Territory and the Republic of Tatarstan. In Naberezhnye Chelny, Minister Karimov had a meeting with Ford Sollers employees. The meeting was also attended by Mayor of Naberezhnye Chelny Nail Magdeyev, President and CEO of Ford Sollers Adil Shirinov, representatives of the Tatarstan Ministry of Labour and the Employment Centre. The participants to the meeting focused on the current situation with the Ford Sollers JV and measures taken by government agencies. As to the suppliers of automotive components operating under international standards, the Ministry of Industry and Trade of Tatarstan is active in promoting the cooperation of republic’s enterprises producing automotive components both with local automakers and companies from other regions. As part of this, the republic annually hosts the TIAF supported by Automechanika, which allows the suppliers to demonstrate their products and services to potential buyers, to establish direct business links with companies engaged in vehicle manufacturing, repairing and servicing, and with wholesalers and retailers of automotive components. Also with the support from the Ministry, Supplier Days are organised by major Russian and international companies. At the end of May 2019, a Hyundai Supplier Day is scheduled, to which Ford suppliers will also be invited, thus allowing companies to seek new customers and establish new partnerships.